There are so many good books out there, and more being produced all the time. Here are some newer releases, in the nonfiction/ spiritual growth genre, shared with me by friends. They are deep books for truth, joy, and healing. In a world full of noise, where the loudest people win and the most aggressive get what they want, Unseen dances to a different tune. Whose eyes on you matter? What time is wasted? Do you trust your Father? My friend Tina gave me this book to help me through my dark time. I am grateful. What does grace mean when you’ve always tried to live good? What masks do you hide behind? This book was a gift to me from my friend Irene. “What comes into our minds when we think about God is the most important thing about us,” said A. W. Tozer. When we’ve grown up thinking about God, it can be hard to unpack our own conceptions, preconceptions, and misconceptions. We know Him well – don’t we? Smith returns to the most basic truths about God, and invites us to dwell there until who He is profoundly impacts who we are. And this one was a gift from a stranger, Crystal. But we will be friends someday soon. Mr. Hague tells the story of living with an autistic son, clinging to faith when God does not deliver on cue, and learning to rejoice in lament. My friend Shaunda gave me a prayer book that has helped me through times when prayer did not come easily. I love it so much, for how it speaks the unutterable things of the heart, and for how it grounds the soul in truth: about God, about oneself, and about the world. It uses old language, ties into old worship, teaches old humility. I’ve found it incredibly shaping: a good doorway to open the heart to greater communication with the Lord. A Diary of Private Prayer contains thirty-one days of prayer (both morning and evening), plus a Sunday prayer. The verso pages of the book are all blank, for your own notes or journaling with God. What inspirational books have you been reading? That looks like a good list. And friends who give good books are the best. My current slow read is Out of the House of Bread by Preston Yancey. He teaches one how to be human by teaching one how to bake bread. By inviting God into our kitchens we learn how to walk with him in the rest of life. All great, needed reads for me! Sending ❤️ and 🙏 your way! I just finished Suffering is Never For Nothing by Elisabeth Elliot. I enjoy books that will help me in my walk with the Lord and maybe step on my toes a bit. “Seated with Christ” by Heather Hillman. It’s about living freely in a culture of comparison. Book lists are my favorite kind of blog posts. Also, I was delighted to see Unseen on your list! My copy has been read through twice now and underlined in many places. It speaks to so many places in my life right now. ‘Daring to Hope’ by Katie Davis Majors. Her story of finding grace and joy thru the painful and broken situations, working w/ orphaned children in Uganda. 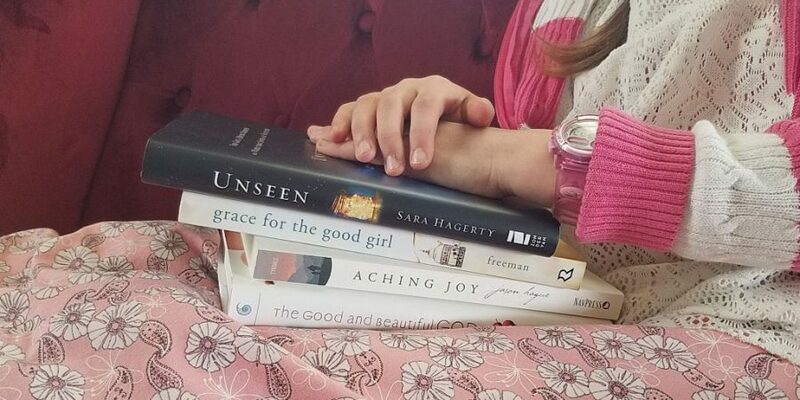 Freeman’s and Smith’s are both on my shelf waiting to be read and Hagerty’s ‘Unseen’ is on my ‘to get’ list; now I’m going to need to add that last one to my list too! This is good Shari. Thank you for posting these looking forward to looking into them. I’ve never heard of any of them which is unusual for me 😉 I just looked up Emily Freeman and am listening to her right now. Just finished the book “The Gospel Comes with a House Key: Practicing Radically Ordinary Hospitality in Our Post-Christian World’ by Rosaria Champagne Butterfield. It was such a wonderful book.